Israel's Kadima party has left Prime Minister Benjamin Netanyahu's government in a dispute over military conscription for ultra-Orthodox Jews. Kadima, the largest party in the Knesset, had only joined the coalition in May to avoid an early election. But it failed to reach an agreement with Mr Netanyahu's Likud on replacing the Tal Law, under which seminary students can defer military service. In February, the Supreme Court declared that the law was unconstitutional. The prime minister held meetings with Kadima MPs earlier on Tuesday in an effort to convince them to remain in his governing coalition. He is reported to have proposed that 50% of ultra-Orthodox Jews, or Haredim, between the ages of 18 and 23 would be drafted by the Israel Defence Forces (IDF) and another 50% would be drafted into operational civil service between the ages of 23 and 26. 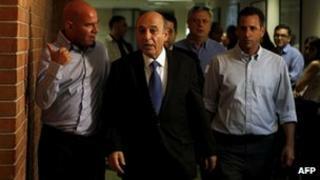 But Mr Mofaz rejected the idea and later called a party meeting, where all but three MPs voted to leave the government. "It is with deep regret that I say that there is no choice but to decide to leave the government," Mr Mofaz said afterwards. He added: "Netanyahu's proposal contradicts the ruling of the Supreme Court of Justice, does not conform to the principle of equality, is disproportionate and does not meet the tests of effectiveness that are set down in the Supreme Court's ruling, or the principles of the committee on equalising the burden of IDF service." An alternative to the Tal Law must be passed by the end of July. Mr Netanyahu meanwhile denied reports that he would call an early general election once the Knesset returned from its summer recess. "Since the government was formed, people are always warning that there will be elections," he said. "There will be elections in the end because the law requires it. You have to be ready because elections could be initiated at any given moment. But wait patiently. They could be held in 2013." The end of the Knesset's current term is in October 2013.